Engineered stone is handsome, durable and maintenance free. Natural stone, like granite or marble or quartzite, makes beautiful, durable, heat-resistant and scratch-resistant countertops but natural stone is not without its problems. Quarried and sawn into slabs that are later refined and polished to countertop dimensions, natural stone is porous and subject to flaws and variations in its integrity. The porosity means that natural stone countertops are vulnerable to staining and must be sealed before use and resealed once or twice a year thereafter. As its name suggests, engineered stone is designed to overcome some of natural stone's liabilities. Most of the popular brands of engineered stone combine a large proportion ( 93 percent by weight, 66 percent by volume) of crushed quartz crystals with a binder of polyester resin. The high proportion of quartz results in a surface that is essentially as hard as stone, and the polyester resin makes the material slightly resilient and thus less prone to chipping than natural stone. 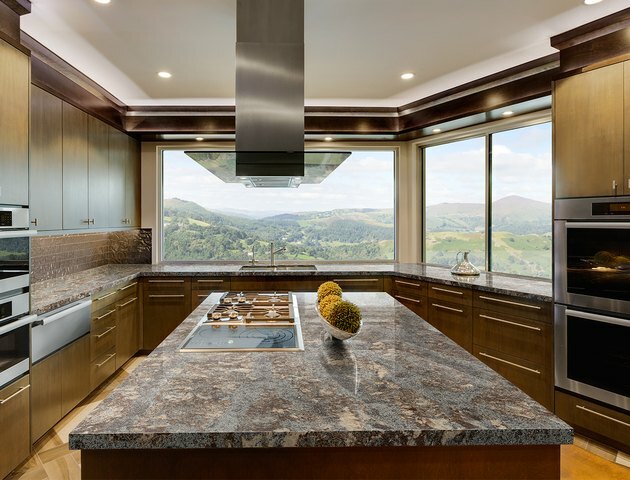 Engineered stone countertops are considered heat resistant, but the resin component is, after all, a plastic, and so engineered stone is not as resistant to heat as natural granite or marble. Although it's the most common, quartz isn't the only stone that's used in engineered stone. Granite and marble can also be found in various engineered stone countertops. When crushed marble is combined with resin, it's generally called cultured marble. Marble, of course, is softer than quartz, and so cultured marble is likewise more apt to scratch and requires special care. Engineered stone can be as dramatic as natural stone. Engineered stone countertops are essentially maintenance free. Because they are non-porous by manufacture, they do not require sealing or any special maintenance. The surface won't stain and won't absorb liquids, making it impervious to mold, mildew and bacteria, as well. Engineered stone's hardness makes it resistant to scratches and cuts, but a cutting board is nevertheless recommended if you want to keep your knives sharp. Given the advantages of engineered stone over natural stone countertops, why, you might ask, would anyone choose to go natural? The answer to that is largely aesthetic and a matter of personal taste. Natural stone is subject to the irregularity and variety that natural processes produce and which some people prefer. Engineered stone tends to be far more uniform and consistent. Often the point of contention is one of authenticity, but it's up to the beholder to determine what that means and its importance. Certainly, natural stone is authentic, but engineered stone is inauthentic only if one views it as an imitation of natural stone. Some varieties veer more in that direction than do others, but it's possible to view engineered stone as being authentically itself, not an imitation at all. Engineered stone can also have its own unique character. Popular brands of engineered stone include Silestone, Cambria, Caesarstone, Technistone and Icestone. All use similar manufacturing technology and are basically equivalent. Engineered stone is made in countries around the world; Italy, Spain and Israel are big producers. Cambria is the only brand of engineered stone countertop produced in the U.S. Because so much is imported, the availability of particular brands may vary regionally. 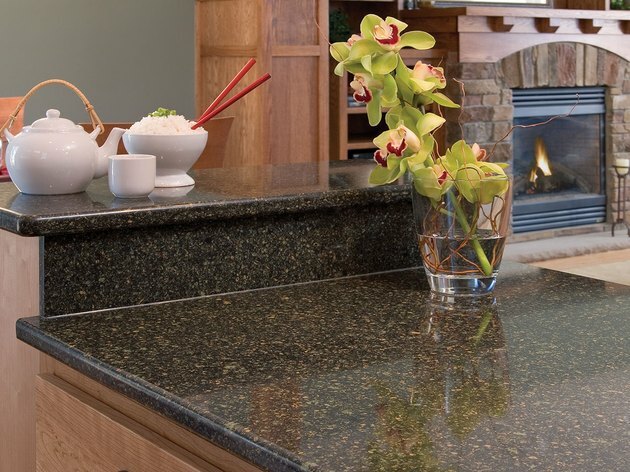 Recycled glass countertops bring color and liveliness stone can't match. Similar to engineered stone but without the stone, recycled glass is relatively new as a countertop material. Made from crushed glass combined with resin, the manufacturing process is similar to that of engineered stone. 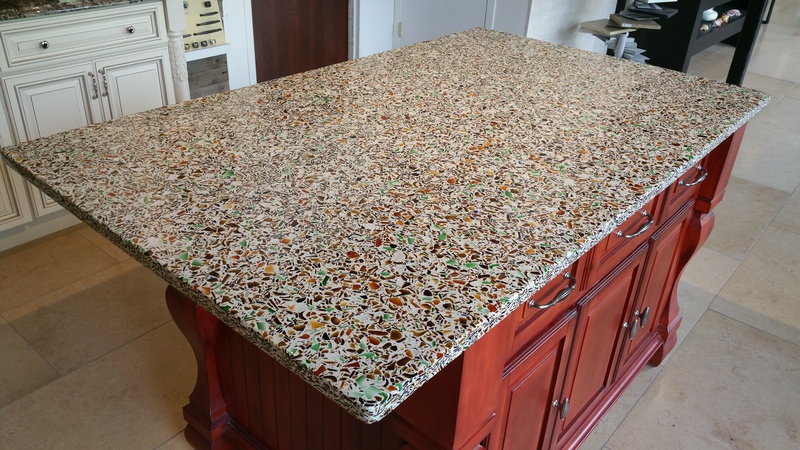 Like stone, the finished surface of recycled glass countertops is tough and non-porous, resistant to staining and heat, and easy to maintain. Because it incorporates recycled material, glass countertops are environmentally friendly. Generally, the design aesthetic of recycled glass countertops doesn't aim at impersonating stone. The effect is contemporary, exuberant and stylish. Engineered stone floor tiles offer rich texture and variety. Engineered stone is also used in the manufacture of tile for backsplashes and flooring. Sometimes referred to as agglomerated stone tile, the two most common types combine polyester resin with either crushed granite or crushed marble. The difference between the two types corresponds to the qualities of the stone components. Marble is softer than granite, and the tile in which it is incorporated tends to show wear more quickly. On the other hand, when it is worn, its softness makes marble-based tile easier to refinish than granite-bearing tile. Both types of agglomerated stone tile require special care in the selection of the adhesive that is used. Because the polyester resin binder in engineered stone is susceptible to degradation from ultraviolet light, it is not considered suitable for exterior use. Recently, a new form of engineered stone tile has been introduced that combines the toughness and durability of ceramic with the softness and warmth of vinyl. Composed of roughly 30% vinyl and 70% ceramic and produced as individual tiles, it comes in a variety of shapes, colors and designs. 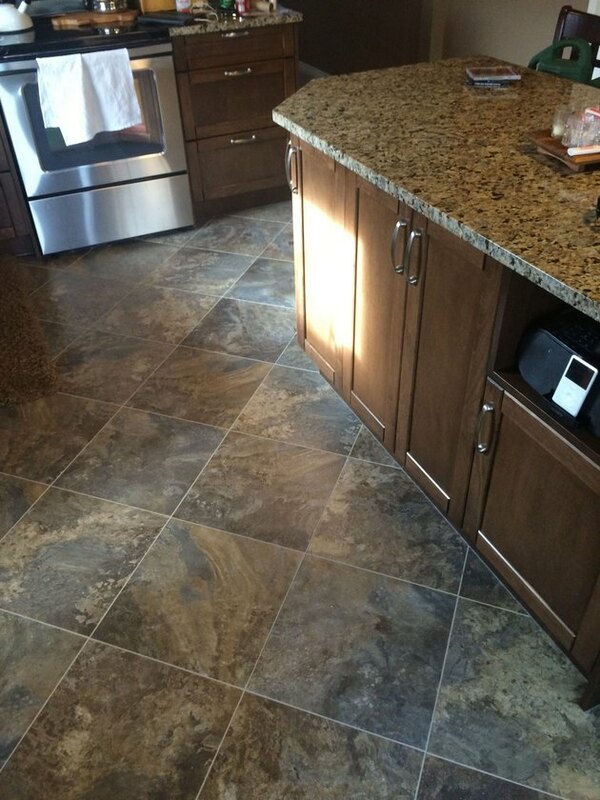 In a departure from traditional vinyl, it's grouted like traditional stone and ceramic. Popular brands include Armstrong Alterna and Congoleum Duroceramic. Any discussion of engineered stone would be incomplete without recognizing the other countertop materials that, one way or the other, emulate stone. 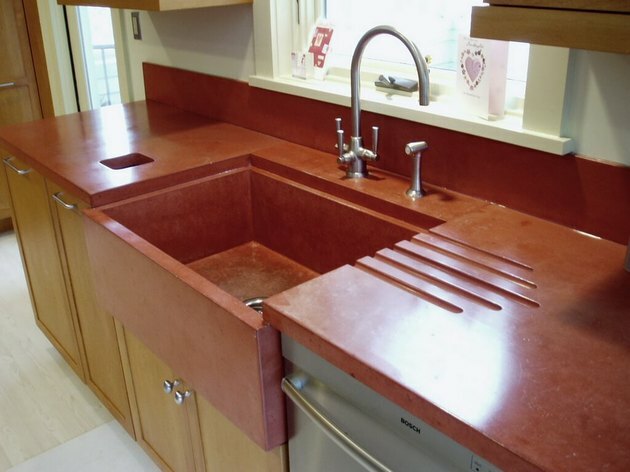 Solid surface countertops can resemble stone… or not. 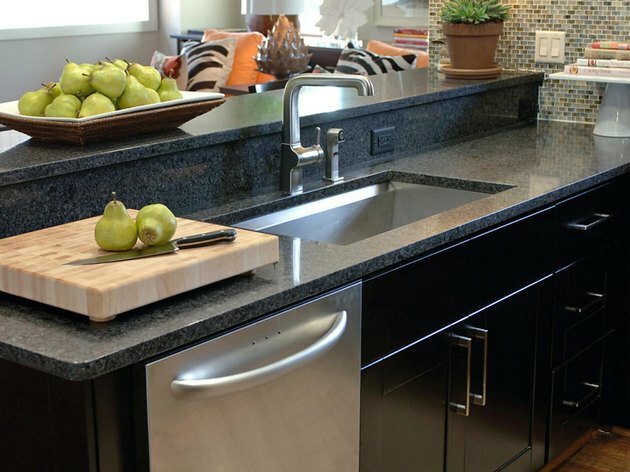 Unlike engineered stone, solid-surface countertops are composed primarily of very hard, very durable acrylic. Colorants and particulates introduced into the acrylic mixture are often chosen to simulate stone, but solid-surface countertops are also offered in solid, or even bright, sometimes translucent colors. 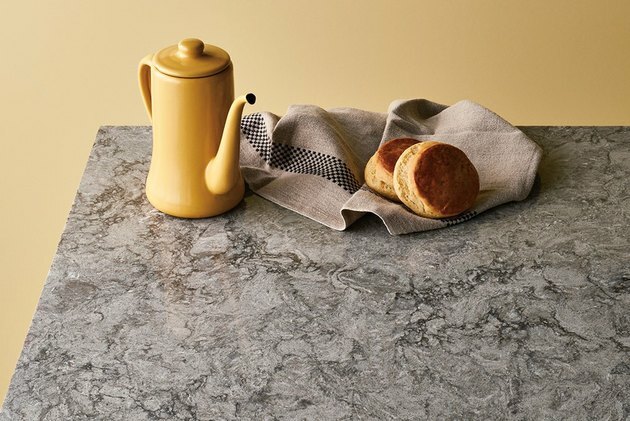 Like engineered quartz, solid-surface countertops are non-porous and easy to maintain. They are more susceptible to scratching and knife cuts than quartz, but because their color is consistent throughout, damage to the surface can often be sanded and buffed out. Composed of solid acrylic, solid-surface countertops are more vulnerable to heat than quartz or stone, so care must be taken to protect them from hot pans and countertop cooking appliances. Properly cared for, solid-surface countertops should be good for 12 to 20 years or more. Solid-surface technology has also been employed to produce sinks and backsplashes that exactly match the countertops so that it's possible with solid surface to have countertop, sink and backsplash all seamlessly integrated. Solid surface countertops are available from a number of manufacturers. Popular brands include Corian, Wilsonart, Swanstone and Samsung Staron, but availability varies by region and by supplier. Since many of the brands offer similar styles and colors in their product range, it's worthwhile to compare prices between brands. Concrete countertops can be unexpectedly elegant. Although the idea of concrete countertops may sound, at best, blandly utilitarian, the fact is that concrete can be starkly beautiful, even elegant. Concrete can be embedded with stone glass, shells or other materials to give it depth and interest. It can be pigmented to nearly any color you wish, and a skilled installer can, with staining, produce the appearance of natural stone or other artistic effects. Like natural stone, concrete countertops must be properly sealed at the beginning and resealed every 1 to 3 years. Unless concrete is sealed, its porosity makes it prone to staining. Concrete is, of course, very tough and stands up well to hard use. It won't scratch and is eminently heat resistant. Unlike engineered stone countertops, concrete is custom cast to fit your specific layout—either pre-cast in a shop on special casting tables and cured under controlled conditions, or formed on site where they can be precisely fitted from the outset. Despite the relatively low cost of the component materials, because concrete countertops are not mass-produced, they are labor- and skill-intensive and they tend to be as costly as natural or engineered stone.